WILLEMSTAD – Curacao has now the Plaza Helmin Magno Wiels, which is located in the neighborhood where the late politician resided. 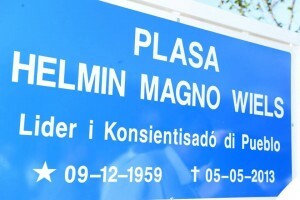 The plaza was inaugurated on Sunday, May 4 by the Prime Minister and party colleague of Helmin Wiels, Ivar Asjes. There is one little problem though. The birthday on the sign, indicating the plaza’s new name, is not correct. Helmin Wiels was not born in 1959 but in 1958. According to some people, this is what happens when the government rushes into things and doesn’t let the appropriate institutions do their work.